In medium bowl, mix chopped dried fruits, raisins and 1 1/2 cups of the apple juice. Refrigerate about 4 hours or overnight until fruit plumps up; draining any excess juice. Heat oven to 350°F. Unroll pie crust into ungreased 15x10-inch pan. In 2-quart saucepan, thoroughly mix cornstarch and remaining 1/2 cup apple juice. Heat over medium heat, stirring constantly, until mixture thickens and clears. Add applesauce, lemon juice, almond extract and fruit mixture, stirring until well blended. Spoon fruit mixture onto center of crust to within 2 inches of edge. 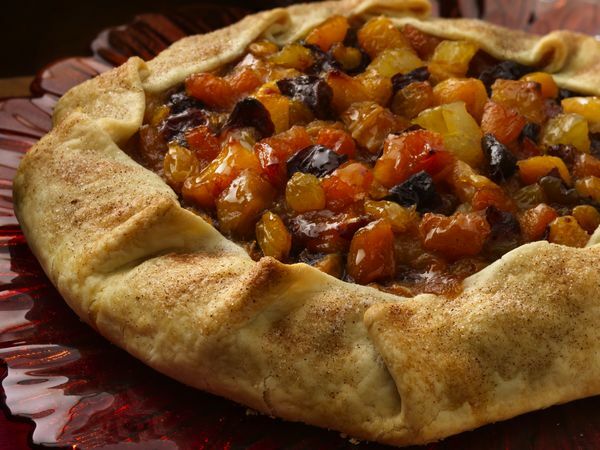 Carefully fold 2-inch edge of crust up over fruit mixture, pleating crust slightly as necessary. Sprinkle sugar and cinnamon over crust edge. Bake about 50 minutes or until crust is golden brown and fruit mixture is bubbling. Cool 30 minutes before serving. Cover and refrigerate any remaining crostata.